Find gang&hyphen;related publications: View a curated list of publications sorted by category; download NGC newsletters; peruse a detailed analysis from the National Youth Gang Surveys of law enforcement agencies across the nation; and view videos and webinars. Use the checkboxes below to select publications from relevant categories. Select a category above to view publications related to that category. The 2009 Office of Juvenile Justice Delinquency and Prevention revised publication guides communities in conducting comprehensive assessments to address gang problems. The 2009 revised Office of Juvenile Justice and Delinquency Prevention publication guides communities in developing implementation plans to address community gang problems based on a comprehensive assessment. It focuses on a multidisciplinary approach addressing five basic strategic areas. Second Edition of Office of Juvenile Justice and Delinquency Prevention’s Best Practices in the Comprehensive Gang Model. The June 2012 National Gang Center Bulletin discusses issues related to effective street outreach practices in the Office of Juvenile Justice and Delinquency Prevention Comprehensive Gang Model. The 2007 National Gang Center Bulletin outlines the development, role, and practice of multidisciplinary gang intervention teams in addressing gang problems. This Office of Juvenile Justice and Delinquency Prevention 1994 publication includes a research summary related to the Comprehensive Gang Model. This Office of Juvenile Justice and Delinquency Prevention 1994 publication includes a research summary on recommended policy and practices for communities and community stakeholders in addressing gang issues. The Office of Juvenile Justice and Delinquency Prevention 1999 Fact Sheet on implementing the Comprehensive Gang Model. Link to Arizona State University’s portico to Walter Miller’s unpublished book based on work in Boston’s Roxbury community. 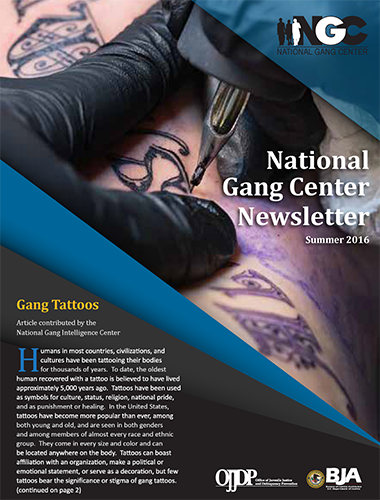 The 2010 National Gang Center Bulletin details the development of street gangs in the United States. A 2007 abstract in the Juvenile and Family Court Journal addressing the realities of youth gangs. 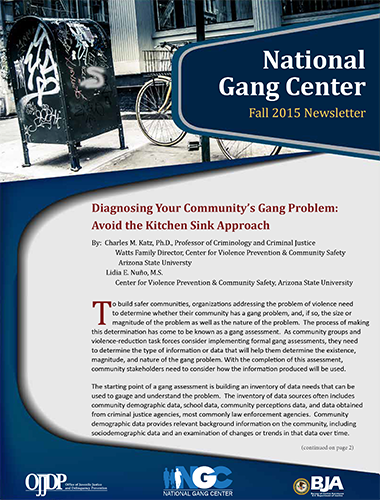 A 2009 National Gang Center Bulletin which discusses mobilizing and organizing communities to address gang problems. It provides a number of examples from various communities. The 2006 National Gang Center bulletin discusses the impact of gangs in a number of different contexts. This 1997 Bureau of Justice Assistance monograph provides a problem-solving process to address gang problems. The 1998 Bureau of Justice Assistance monograph discusses practical solutions to address community gang problems. The 2005 National Gang Center bulletin discusses trends and potentially related problems to the emergence of gangs in small towns and rural counties in the United States. The 2004 National Institute of Justice journal article discusses gangs in rural areas. The 2004 OJJDP Juvenile Justice Bulletin discusses findings of surveying tribal police officers regarding tribal gang activity in Indian Country. The 2002 OJJDP Juvenile Justice Bulletin addresses the emergence of modern youth gangs over an extended period of time in various settings. The 2001 OJJDP Juvenile Justice Bulletin discusses the nature of hybrid youth gangs. The 2001 OJJDP Juvenile Justice Bulletin represents a step toward rectifying the deficiencies of prior research. It summarizes past and present research and tracks the rise in the number of female gangs. The 2004 U.S. Department of Justice Office of Community Oriented Policing publication discusses the topic of graffiti in the Problem Oriented Policing Series. The March 2000 Office of Juvenile Justice and Delinquency Prevention Bulletin discusses lessons learned from the four Office of Juvenile Justice and Delinquency Prevention Comprehensive Gang Model pilot sites. The U.S. Department of Justice Office of Community Oriented Policing publication focuses on the subject of network analysis in addressing gangs. The 2005 Bureau of Justice Statistics brief discusses violence by gang members over a ten-year period (1993–2003). The 1998 Office of Juvenile Justice and Delinquency Prevention Juvenile Justice Bulletin seeks to clarify the term “gang” and addresses gang migration. A 2015 report published by The UN Refugee Agency specifically discussing the impact of gang violence on women and how it relates to international refugee law. This 2016 Congressional Research Service report describes the gang problem in Central America, discusses country approaches to deal with the gangs, and analyzes U.S. policy with respect to gangs in Central America. This 2005 unclassified assessment from the FBI provides an overview of the international activities of the MS-13 criminal organization. Published by the U.S. Department of State, Bureau of Diplomatic Security, this report is produced by a private and public sector group that details country crime and safety reports. This U.S. Agency for International Development (USAID) assessment analyzes the nature of gangs in Central America and Mexico, and provides strategic and programmatic recommendations to USAID about addressing the gang problem in the assessment countries. This National Council on Crime & Delinquency report examines how and why girls become gang-affiliated and how and why some girls avoid or leave gang activity. This 2017 Urban Institute report provides an evaluation of the Chicago Violence Reduction Strategy. This resource by the Centers for Disease Control is designed to help communities use evidence-based actions to effectively prevent youth violence, including gang violence. This is a companion document to the Preventing Youth Violence: Opportunities for Action resource. It is designed to help communities learn more about the causes and impact of youth violence (including gang violence) and identify actions that can be taken to prevent youth violence. This 2006 United States Attorney’s Office Bulletin discusses the research related to gang membership and lays out guidelines for implementation of community prevention and intervention efforts. This National League of Cities Toolkit is based on work within the California Cities Gang Prevention Network. 2013 National Gang Center Bulletin focused on gang intervention and desistence in regard to gang members leaving gangs. The American Probation and Parole Association’s C.A.R.E. model is designed to assist community corrections agencies’ participation in interagency anti-gang collaborative initiatives. The 2007 National Gang Center Bulletin outlining the development, role, and practice of multidisciplinary gang intervention teams in addressing gang problems. This is a link to access the American Probation and Parole Association CD produced for the Bureau of Justice Assistance, which outlines recommended practices in the various stages of gang member reentry from incarceration to the community. A 2009 National Council on Crime and Delinquency publication on establishing outreach programs with recommendations and lessons learned. The 2001 Office of Juvenile Justice and Delinquency Prevention Bulletin describes the intervention programs that showed the strongest, most consistent impact on recidivism for serious juvenile offenders. The 2000 Office of Juvenile Justice and Delinquency Prevention Bulletin on implementing intensive community-based aftercare programming for serious offenders. This bulletin highlights a number of topics in the investigation and prosecution of gang crime. The 2008 Bureau of Justice Assistance report provides guidelines to creating and operating gang task force and gang intelligence units. Property Abatements—The Other Gang Injunction: Project T.O.U.G.H. The 2009 National Gang Center Bulletin by staff from the Los Angeles City Attorney’s Office highlights that entity’s Project T.O.U.G.H. The Office of Juvenile Justice and Delinquency Prevention manual provides guidance to law enforcement and prosecutors from investigation through prosecution of gang crime. A 2009 publication providing guidelines by the National District Attorney’s Association for prosecutors seeking gang injunctions. A 2004 Bureau of Justice Assistance abstract by the American Prosecutor’s Research Institute provides guidance for prosecutors in prosecuting local gang cases. The 2004 Department of Justice publication addresses the impact of gang injunctions on neighborhoods in San Bernardino, California. The 1996 Office of Justice Programs publication addresses a variety of issues related to witness intimidation, including the act of intimidation, legal issues, and methods to combat the act and the establishment of witness security programs. Link to the Community Oriented Policing Office Website toolkit, which provides resource information for various gang-related issues. The 2004 report was submitted to the National Institute of Justice. It addresses the efficacy of when and whether it is advisable to create specialized gang units. The 2008 guide published by the Office of Justice Programs Office of Community Oriented Policing Services to assist local law enforcement investigating gang crime. The March 2007 Office of Justice Programs Office of Community Oriented Policing Services problem-solving guide for police officers investigating drive-by shootings. The 2006 final report prepared by Michigan State University in regard to Project Safe Neighborhoods for the United States Office of Justice. A 1999 Office of Juvenile Justice and Delinquency Prevention report outlining strategies to reduce gun violence. A guide for police-related gun violence by serious young offenders. The guide was developed as part of the problem-oriented policing series for the Office of Community Oriented Policing. The 2000 Office of Juvenile Justice and Delinquency Prevention report titled “Kids and Guns” was published as part of the National Report Series. The Office of Juvenile Justice and Delinquency Prevention Bulletin was published in 1999 to bring an understanding of the interrelationship of the three title issues. The 1999 Office of Juvenile Justice and Delinquency Prevention Bulletin analyzes data from the 1996 National Youth Gang Survey to provide a picture of youth gang involvement in drug trafficking. A joint effort by the National Center for Education Statistics and the Bureau of Justice Statistics, this annual report examines crime occurring in schools and colleges. A December 2011 Office of Juvenile Justice and Delinquency Prevention Bulletin providing an overview of the findings of funded studies related to bullying in schools. A 2010 National Gang Center Bulletin addressing the problem and assessment of gangs in schools and potential solutions. A 2000 Office of Juvenile Justice and Delinquency Prevention Bulletin providing research insight into the issue of youth gangs in schools. A May 2012 update of the Office of Community Oriented Policing’s Problem Solving Guide regarding bullying in schools. 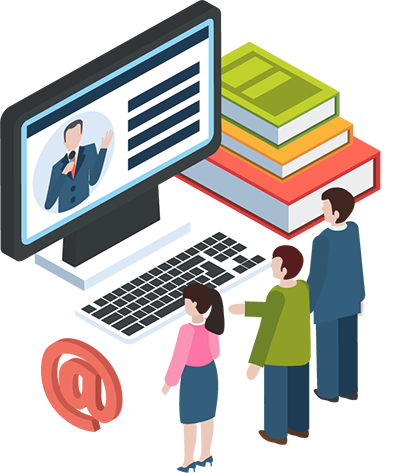 Link to a United States Department of Education Website providing guidance regarding the Family Educational and Privacy Act (FERPA). The 2002 National Institute of Justice publication provides a collection of the Institute’s research on gangs. This 1997 Office of Juvenile Justice and Delinquency Prevention Bulletin summarizes the findings of the Rochester Youth Development study. 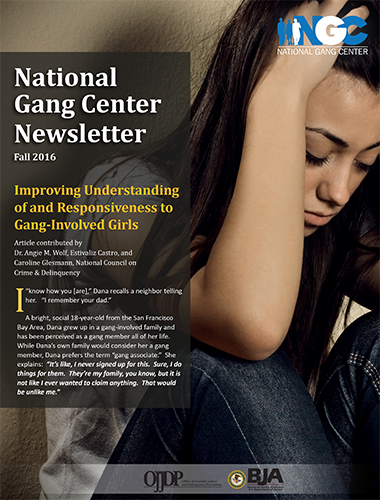 A 2008 Office of Juvenile Justice and Delinquency Prevention Bulletin in the Youth Gang Series summarizing the research on various issues related to gangs, including female gangs and gang migration. A 2000 Office of Juvenile Justice and Delinquency Prevention Bulletin summarizing predictors of youth gang violence at various stages of youth development and implications for violence prevention. A 2003 research report prepared by Arizona State University faculty for the National Institute of Justice summarizing law enforcement responses to gangs in different jurisdictions. A 2000 research study prepared for the United States Justice Department by University of Southern California faculty. An Office of Juvenile Justice and Delinquency Prevention FACT Sheet published in 1999 highlighting findings of the Rochester Youth Development Study. An Office of Juvenile Justice and Delinquency Prevention FACT Sheet published in 1999 highlighting findings of the Pittsburgh Youth Development Study. An Office of Juvenile Justice and Delinquency Prevention FACT Sheet published in 1999 highlighting findings of the Denver Youth Development Study. An Office of Juvenile Justice and Delinquency Prevention Bulletin published in 2001 drawing on data from the Seattle Social Development project to discuss the impact of risk factors on 10- to 12-year-olds. A 2010 Office of Juvenile Justice and Delinquency Prevention Bulletin highlighting findings from the Urban Institute evaluation of the Gang Reduction Program. A 2008 unpublished evaluation funded by National Institute of Justice of Chicago Ceasefire (now known as Cure Violence) by Northwestern University. A 2011 evaluation of the G.R.E.A.T. Program. A 2006 Evaluation conducted for the Office of the District of Columbia Mayor’s Office of Latino Affairs. This fact sheet discusses trends in gang activity, factors influencing local gang violence, and anti-gang measures. The 2001 Office of Victims of Crimes Bulletin provides guidelines for working with victims of gun violence. The 1996 National Institute of Justice abstract addresses issues related to witness intimidation in gang and drug-related crime. The 1995 National Institute of Justice bulletin discusses emerging topics and practices in the area of intimidation of victims and witnesses to crime. A 2006 Office of Community Oriented Policing abstract with guidelines for law enforcement related to intimidation of witnesses to crime. A 2007 National Gang Center Bulletin regarding the issue of intimidation of witnesses specific to gang-related crimes. Guidelines for Building Sustainable Projects by the Institute for Educational Leadership funded by the Office of Juvenile Justice and Delinquency Planning. A 2001 presentation developed by American Indian Development Associates. Sustainability guidelines developed by the National Crime Prevention Council. This section contains an analysis and findings from the National Youth Gang Surveys of law enforcement. Numerous charts and descriptions are provided as a resource for understanding gang problems. These published findings from the National Youth Gang Surveys of law enforcement agencies across the nation assess the extent of gang problems. This document is also available as a plain text file. This document is also viewable online as a Web page. This Webinar outlines flow best to contact street outreach when gang-involved clients are in danger. The Webinar features are collaborative relationship between the Houston Mayor's Anti-Gang Office and the Houston Police Department as a best-practice program to address street gang voilence. This video presentation features gang researchers, practitioners, and young people who were previously involved in gangs. Learn about research regarding gang joining, as well as firsthand insights into the behaviors and the circumstances that you might observe when interacting with youth who are at high risk of joining a gang.